As a Christmas gift to their clients, Universal Favourite created a series of mix-and-match colourful chocolates from tessellating 3D-printed moulds. The Complements chocolates were designed by the Australian agency in collaboration with the Bakedown Cakery in Sydney. Designed to give to clients as end-of-year gifts, the chocolates are described by the studio as a "modular system" of pair-and-share treats and are shaped like small flights of steps. Universal Favourite created the look of the chocolates, experimenting with finishes and colours – each of which corresponds to a different flavour specially developed by the bakery. "The idea was inspired by the complementary relationship between client and designer," said Universal Favourite. "Wanting to create something outside the box that could be paired in endless combinations, we designed an original modular shape that was 3D-printed into positives and then turned into chocolate moulds." The chocolates were presented in a box, which was decorated similarly to the textures and colours patterning the treats inside. While Universal Favourite's festive offerings were made from a 3D-printed mould, other advances in 3D printing have been hailed as the next frontier in food itself. American manufacturer 3D Systems unveiled its own food 3D printers, which use inkjet print heads to spread fine layers of water and sugar into geometric sweets. Others have looked toward the future, with a pair of German students creating a concept for a countertop device that would use muscle and skin cells to print meat at home, and Dutch design studio Michiel Cornelissen Ontwerp designed a 3D chocolate printer. 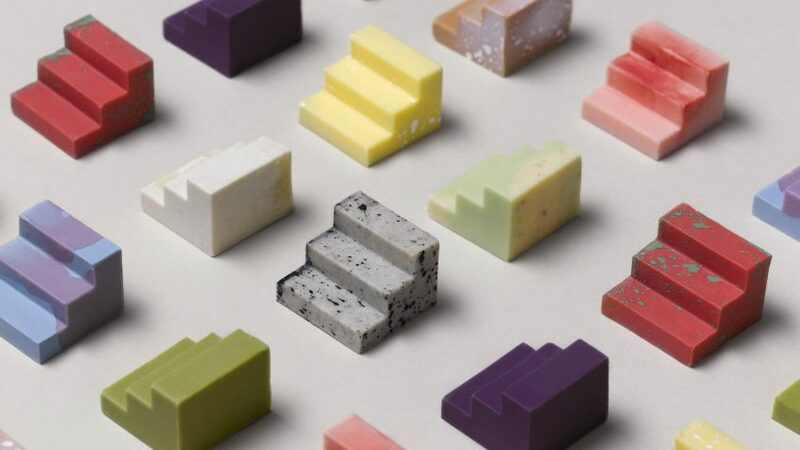 Japanese designer Akihiro Mizuuchi similarly designed a set of unusually-shaped chocolates in the form of precise Lego bricks, while Nendo created nine chocolates moulded into abnormal shapes within a 26-millimetre cube.